Also talks Get Lucky and his "lost Chic album"
Nile Rodgers: a man with a lot to smile about at the moment. 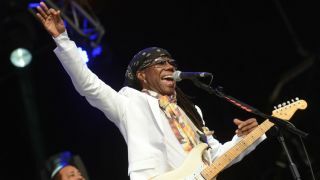 Following his hugely successful collaboration with Daft Punk, disco legend Nile Rodgers has revealed that he's also been working with David Guetta and Avicii. "Last night I was working with David Guetta writing a song," the Chic guitarist told The Official Charts Company. "It was unbelievable, we went until two in the morning, and Arthur Baker and Taylor Dayne popped by - it felt like it was if we were back in the 80s." Of his hook-up with yet another electronic music artist Rodgers said: "I've been working with a super talented writer and producer Avicii. This guy is such a genius writer. We've already written three or four songs together and can't get enough of each other." Discussing the phenomenal success of Get Lucky, which followed a battle with cancer, the guitarist revealed: "Maybe this could feel more special than any other Number 1 record simply because of that. I was facing life and death issues and then to get something so rewarding as a Number 1 record is pretty amazing." Rodgers also confirmed that he's recently unearthed a collection of 'lost' recordings and that he has plans to release them. "I basically call it 'the lost Chic album', even though it's really a Nile Rodgers record. Bernard Edwards, Tony Thompson, Alfa and Luci singing on it. They're just demos, but they're amazing. So now I get to jam with my best friends and I think that I'm going to complete these songs. They sound really good to me, after being tucked away in a vault for 35 years. I restored the tapes and they sound absolutely brilliant." Could Nile Rodgers be set to define the sound of dance music all over again? We wouldn't put it past him.